Use the Shop Vashon Passport as you shop this holiday season and win fabulous prizes! When you shop local, you support the businesses that make Vashon unique and strengthen our community. Our Island retailers do a lot to make Vashon the place we love by: passing out candy on Halloween; lighting up winter nights with garland and the town tree; supporting local artists on First Fridays; participating in Strawberry Festival, CiderFest and other Island events; and sponsoring many island non-profits through donations and financial support. They are able to do these things when you SHOP VASHON. Here is how you can participate in the SHOP VASHON PASSPORT! You can get a passport at the Chamber of Commerce Office or any retailer that has a Shop Vashon Passport Sign in their window. 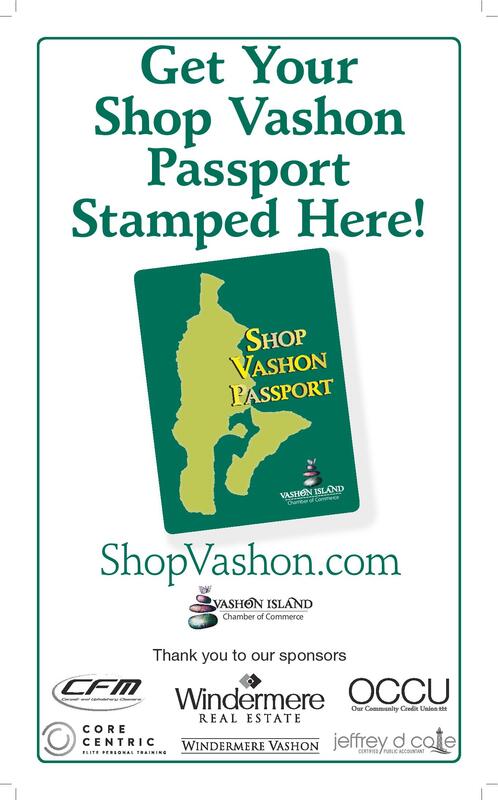 Bring your Passport with you when you Shop Vashon, when you make a purchase (no minimum), get your Passport stamped. Each participating retailer has a different stamp, so get your Passport stamped at each place you make a purchase. You can also get your Passport stamped when you buy gift certificates at any Island business that offers them. So buy a friend a meal, a massage or any other service. Once you collect 12 different stamps from 12 different stores, fill out the top of your Passport and drop the entire Passport off at the Chamber of Commerce Office (17141 Vashon Hwy. SW). We have a box in our office and a mail slot in case we are closed. Your Passport will then be entered into our drawing! SHOP VASHON November 1st through December 24th to get your passport stamped. Completed SHOP VASHON PASSPORTS must be turned into the Chamber of Commerce Office by December 24th in order to be entered into the contest. Valid entries must have 12 different stamps from registered retailers in order to be entered into the drawing. One, $200.00 Visa Gift Card. Four $50.00 Visa Gift Cards. We have an assortment of gift certificates and merchandise prizes from various Vashon businesses for the drawing as well.